Turn heads with the bold graphic design of this navy Elena Miro knit twinset, comprising a three quarter length sleeved sweater with a multi-hued striped hem and matching striped jacket. 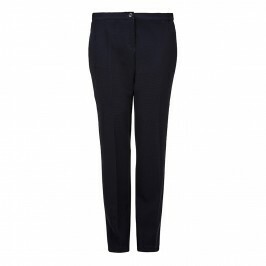 Pair with navy trousers and heels for a smart and stylish ensemble. Graphic design knit twinset. Three-quarter sleeved top and edge-to-edge cardigan. 75% Viscose, 25% Polyamide. Hand Wash or Dry Clean.